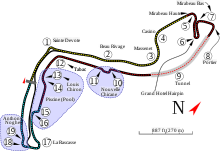 The Monaco Grand Prix (French: Grand Prix de Monaco) is a Formula Ane motor race held each year on the Circuit de Monaco. Run syne 1929, it is widely considered tae be ane o the maist important an prestigious automobile races in the warld an, alangside the Indianapolis 500 an the 24 Oors o Le Mans, it forms the Triple Croun o Motorsport. This page wis last eeditit on 4 October 2017, at 20:31.